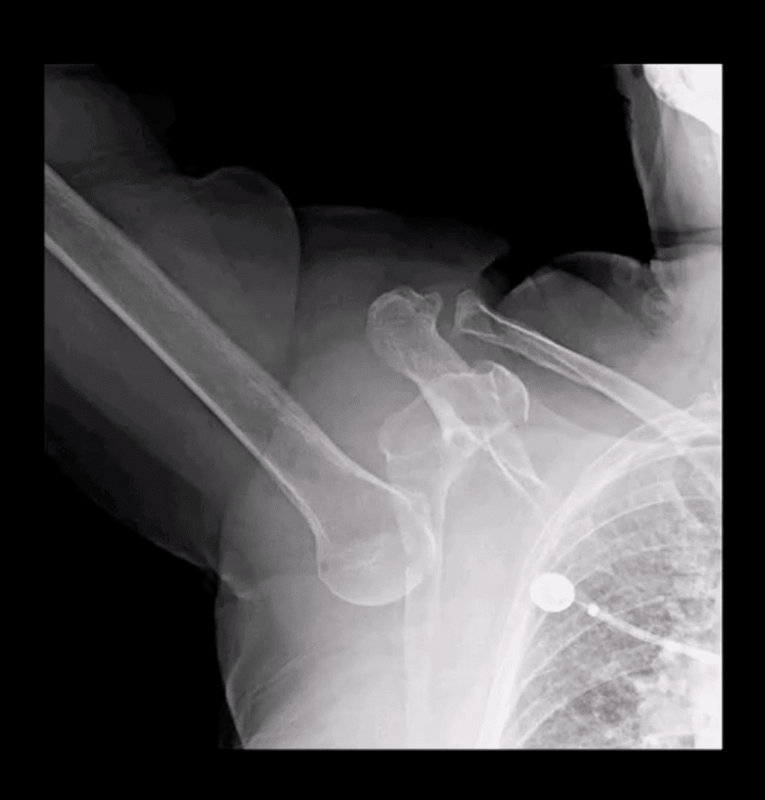 Proximal humeral Fx account for 4-6% of all Fxs. Osteoporotic (OSP) Fx in >60 y.o associated with minimal trauma with F: M 2:1 ratio. 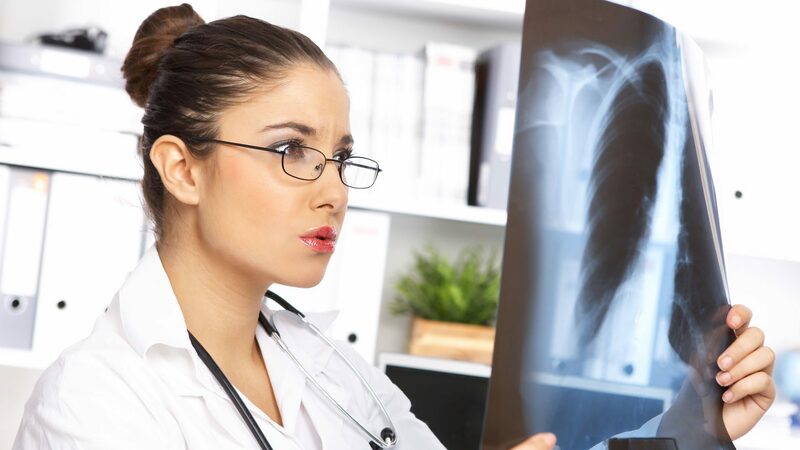 In young patients, acute high energy trauma predominates. Complications: AVN humeral head, Axillary N paralysis. One part Neer Fx- no displacement or very minimal <1-cm/45-degree. 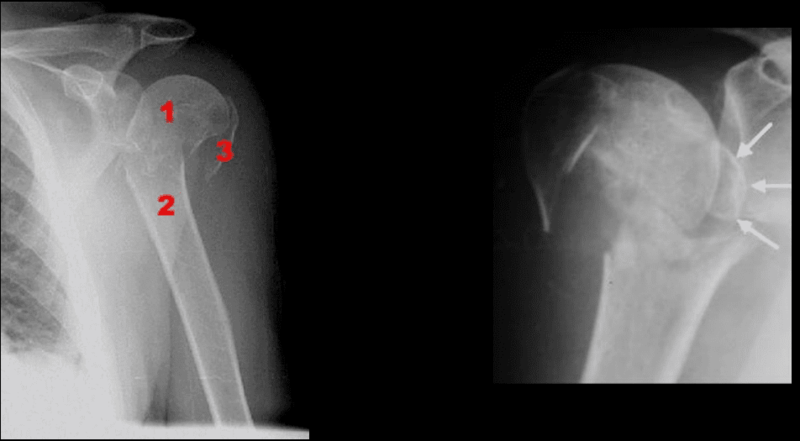 Can affect 1-4 lines and M/C at greater tuberosity. 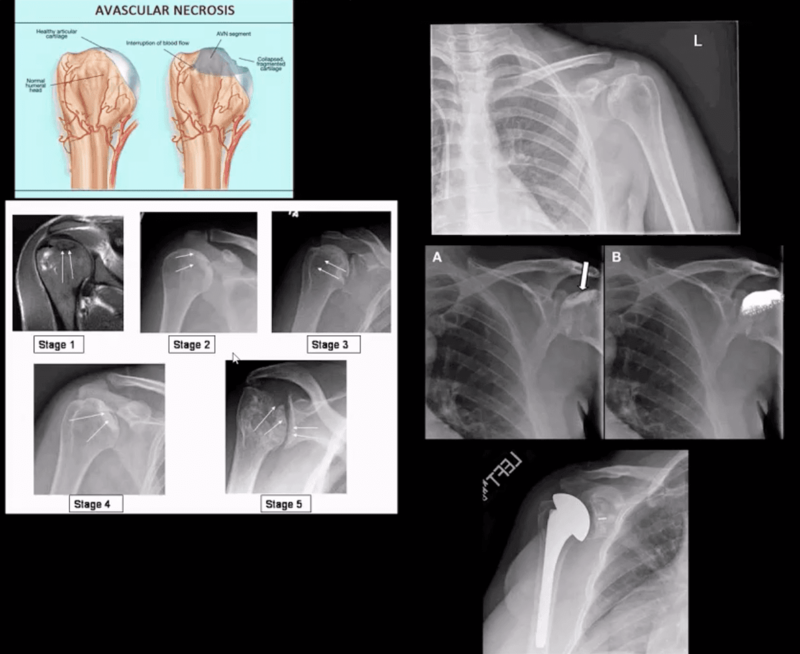 80% of proximal humeral Fx are one-part Neer. 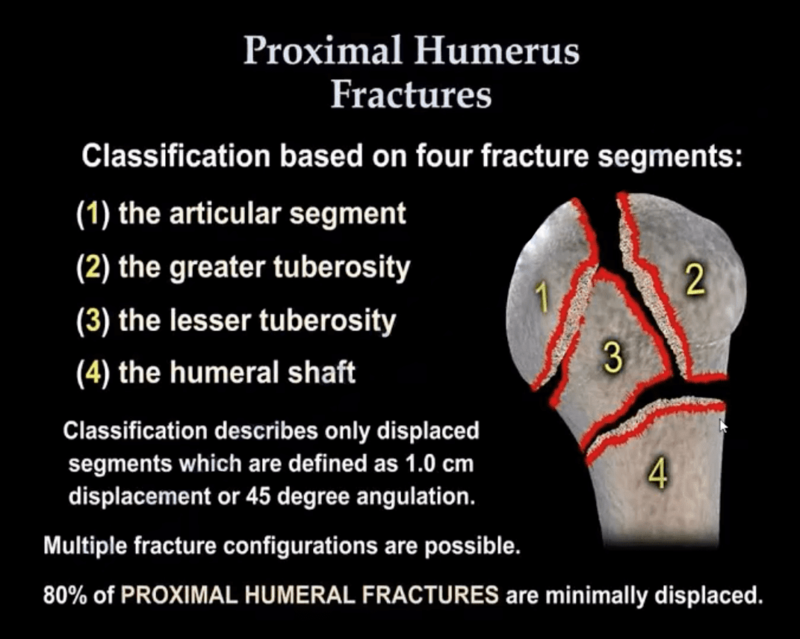 Three-part Fx: 2-parts are displaced >1-cm/45-degrees. 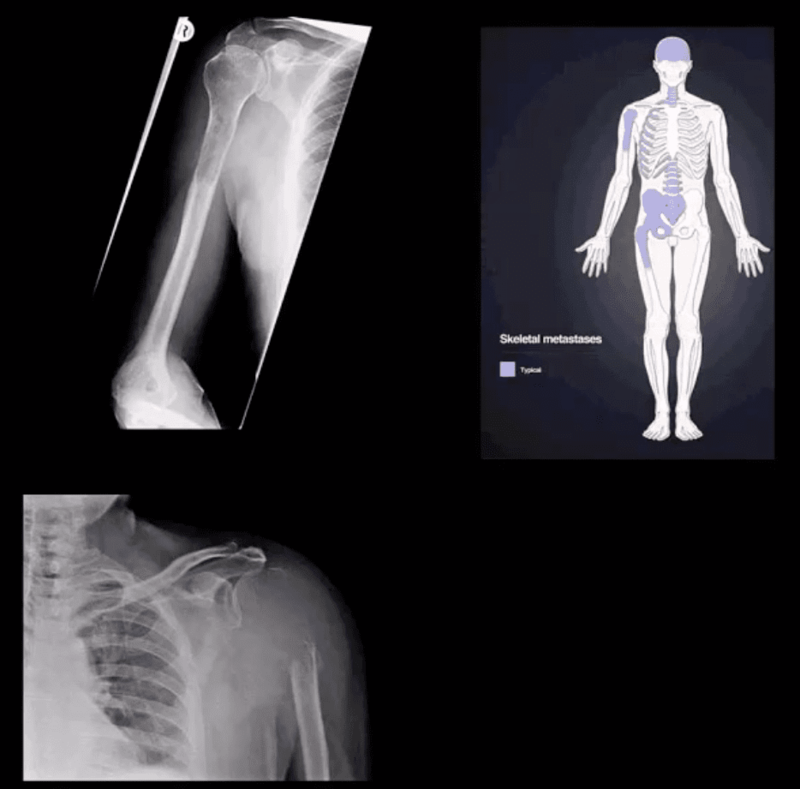 Clinically: AGHJD presents with severe pain, the arm is externally rotated and adducted, severe limitation of movement. 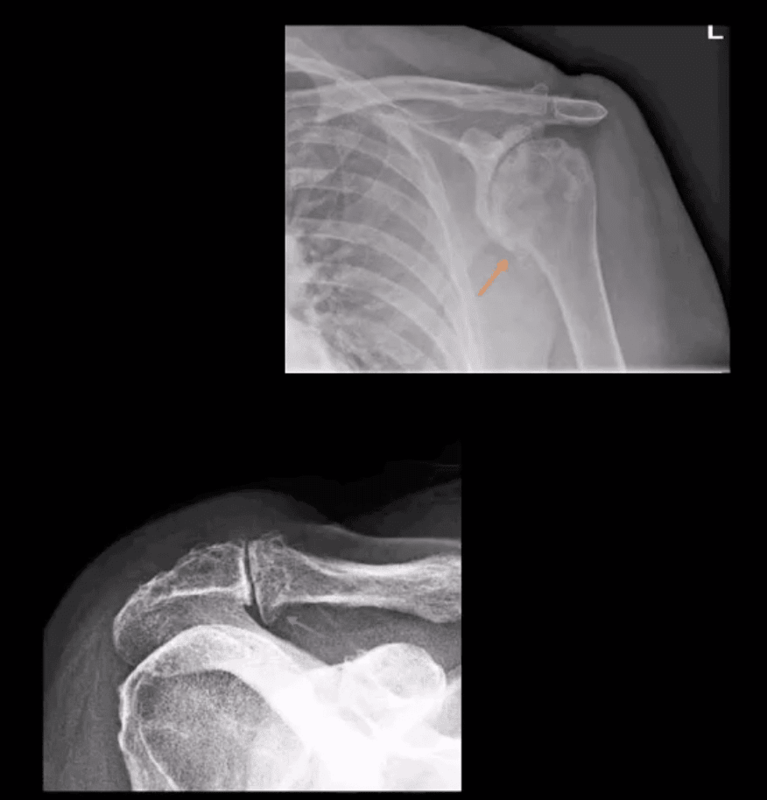 GHJD may persist as chronic dislocation. 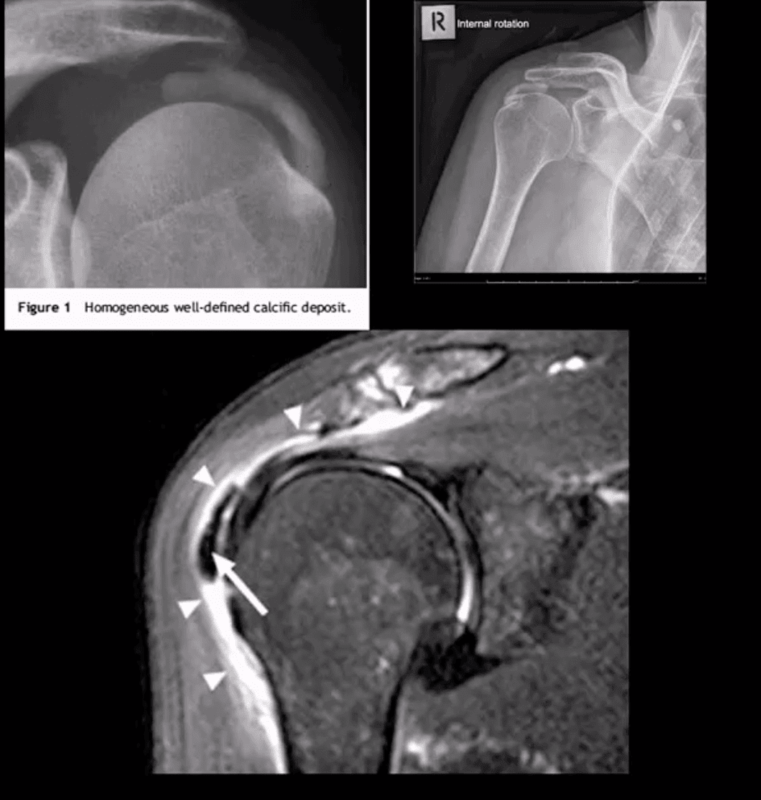 occurs during anterior GHJD d/t impaction of the head into anterior-inferior glenoid. Variations exist (see next slide). BonyBankart can be seen on x-rays. So-called soft tissue Bankart requires MRI. 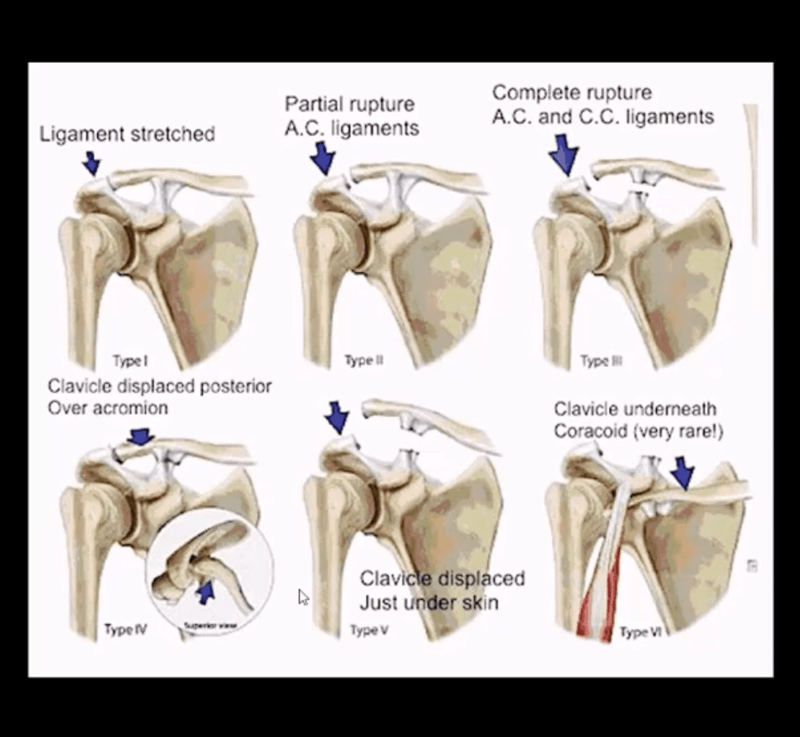 Cartilage (soft)Bankart is the m/c. 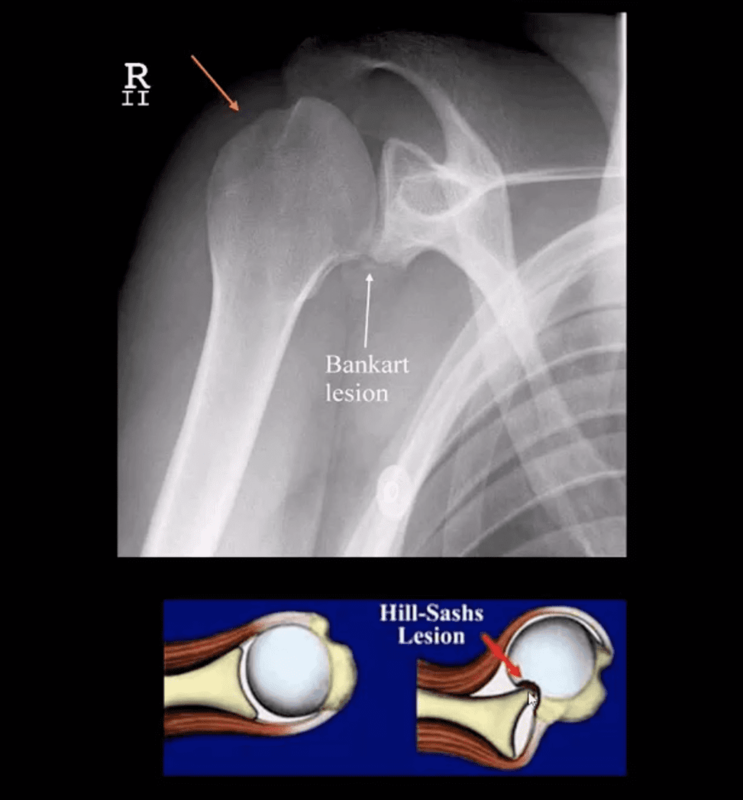 Hill-Sachs aka Hatchet deformity (arrow postreduction)occurs during the same mechanism as Bankart i.e. 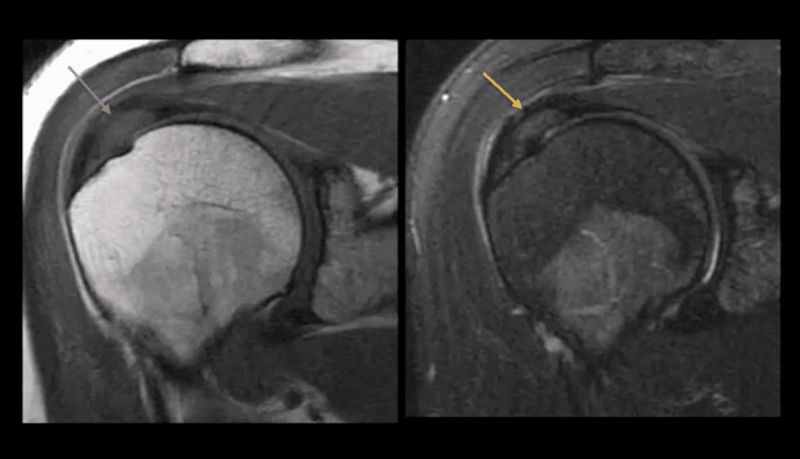 compression and impaction of posterolateral aspect of the head against the glenoid producing wedge-shape Fx. Hill-Sachs lesion may predispose to recurrent/chronic GHJD. 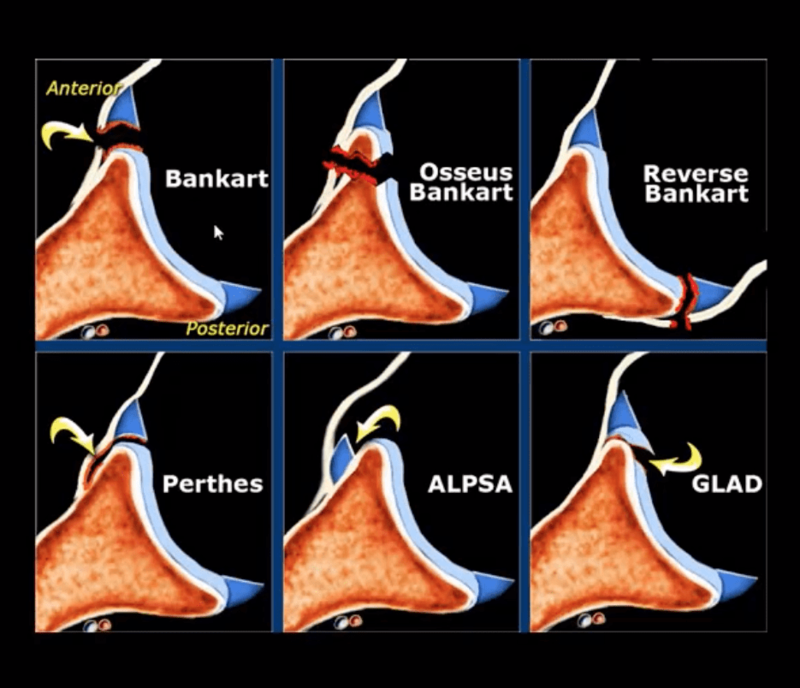 Note different types of Bankart lesion. Onlyosseous Bankart can be seen radiographically. Soft tissue Bankart requires MRI with and without intra-articular gadolinium(arthrogramme). Type 3: tear of AC & CCL. Clavicle is elevated above the acromion. If <2-cm good results with conservative Rx. MSKUS: decreased echogenicity of SSMT, thinning and partial tearing filled with fluid(anechoic areas arrows). Lost convexity of tendon bursal or articular interface. Full Thickness SSMT (rot cuff) tear: degeneration/tearing of rot cuff. 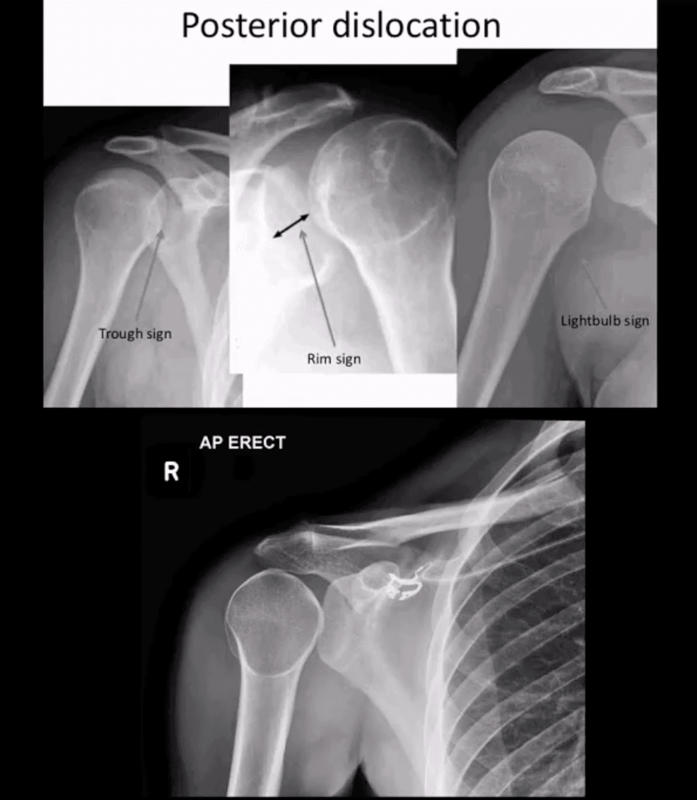 2nd to impingement by Hooked acromion, overhead overuse or acute trauma. 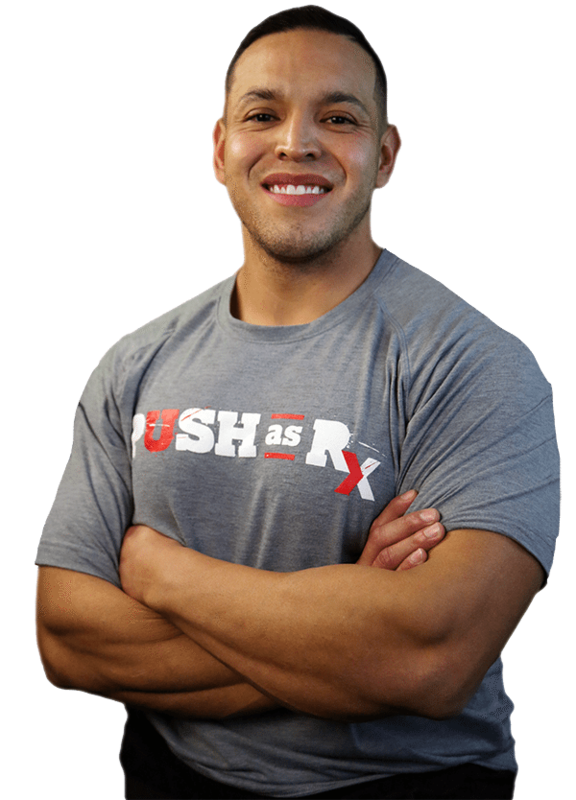 7-25% of shoulder pain in the general population. Clinically: pain on impingement tests. HADD has 3-pathological phases: formation resting-resorption.Mild-to-moderate pain esp.in resting phase. Rx: self-resolution occurs. 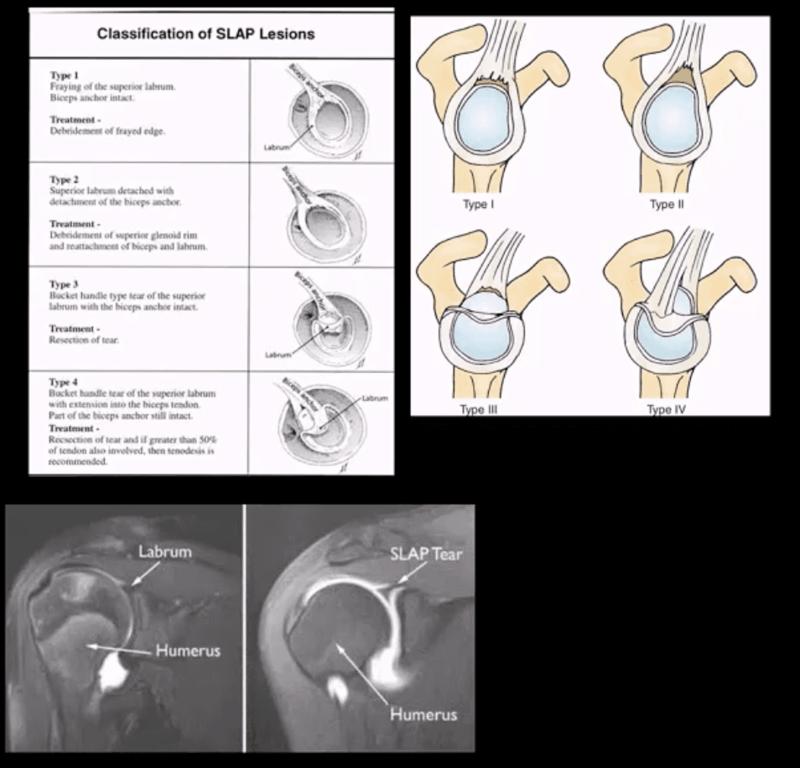 Advanced cases: operative aspiration etc. 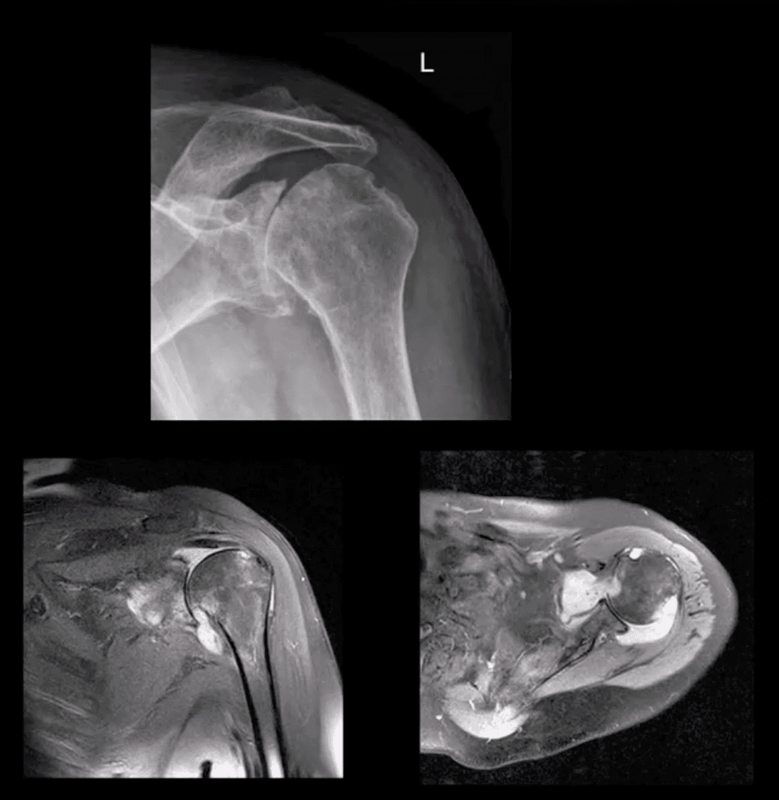 Imaging is crucial: best imaging is MRI arthrography. 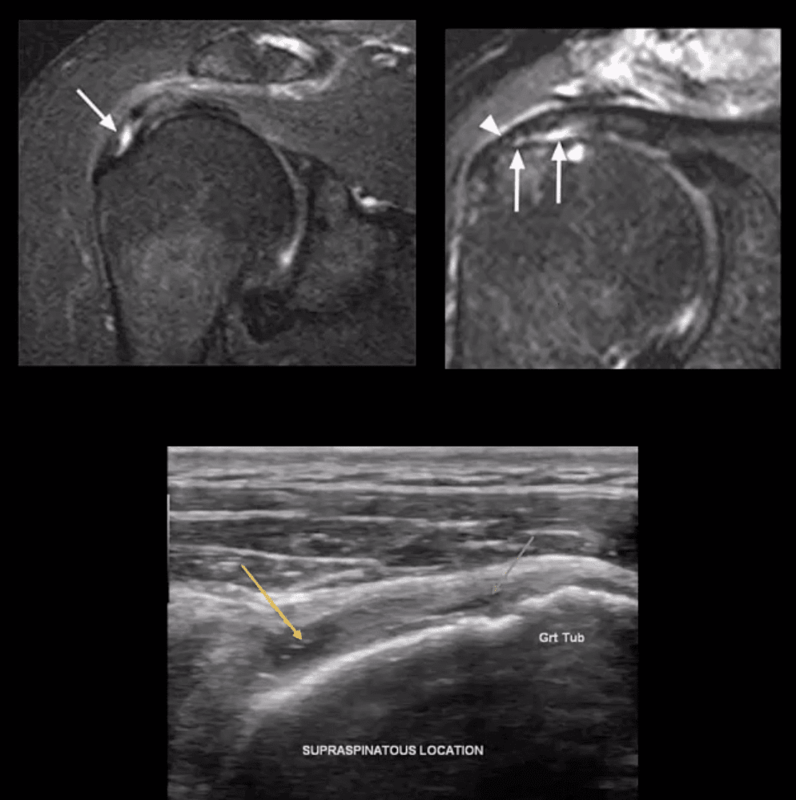 Key signs: hyperintense linear fluid signal withinsuperior labrum +/- extending along the LHBT on fatsuppressedfluid sensitive imaging and FS T1arthrogramme. Best observed on coronal slices. Rx: small tears may heal but unstable tears requireoperative care. GHJ DJD: usually associated with 2nd cause: trauma, instability, AVN, CPPD etc. Presented with pain, crepitus and decreased ROM/function. Associated RTC disease may be present. Imaging; x-radiography is sufficient and provides grading/care planning.Major findings: joint narrowing, osteophytosis esp. at inferior-medial head (orange arrow), subchondral sclerosis/cysts. Often noted superior head migration d/t RTC disease. ACJ OA: common and typically primary withaging. Presents with ACJ loss andosteophytes. Osteophytes along theundersurface of the ACJ “keel osteophytes”(blue arrow) may lead to RTC muscle tear. 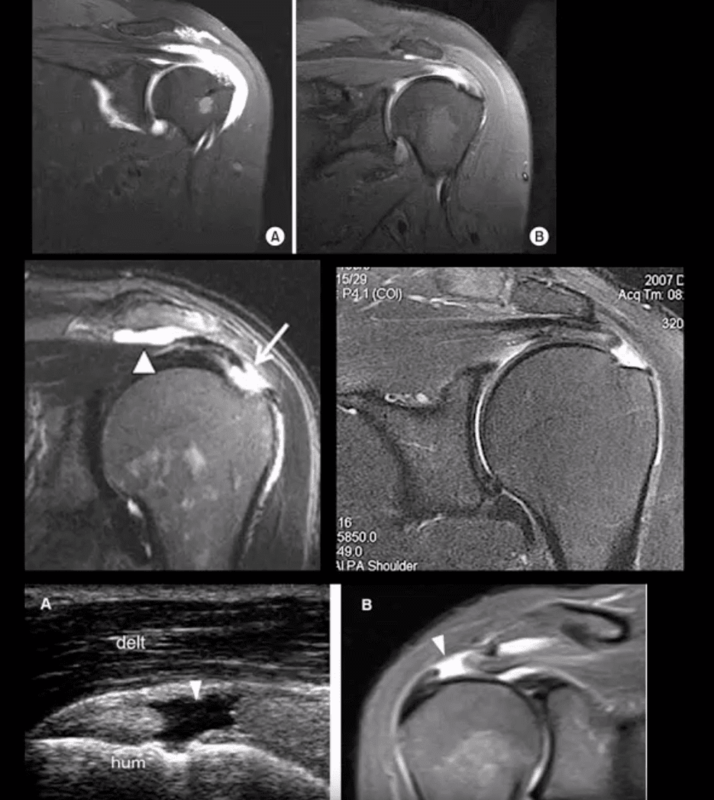 Regional bursitis is other clinical feature ofACJ arthrosis. Rheumatoid Arthritis GHJ: RA is a multisystem inflammatory disease affecting multiple joints lined by the synovium. GHJ RA is common (m/c large joints in RA knees/shoulders). Clinically: pain, limited ROM and instability, muscle weakness/wasting. Hands, feet, and wrists are m/c affected. Imaging: x-radiography reveals periarticular erosions, uniform joint space loss, juxta-articular osteoporosis, subluxations, and soft tissue swelling. 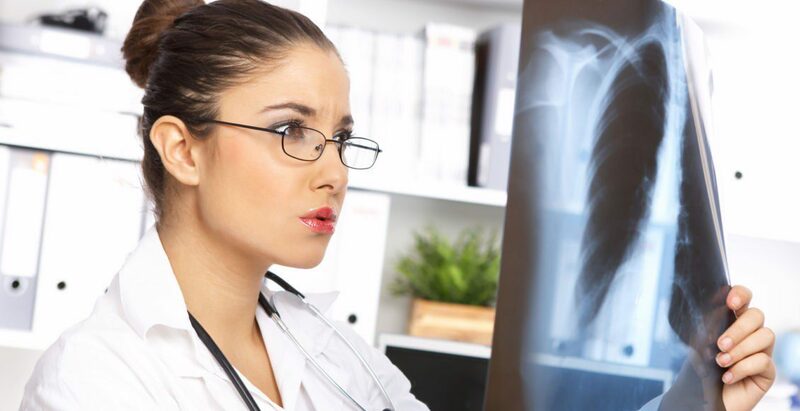 MRI can help detect commonly associated RTC tearing and instability. Early changes can be detected by MSKUS esp. with power Doppler use indicating hyperemia/inflammation. 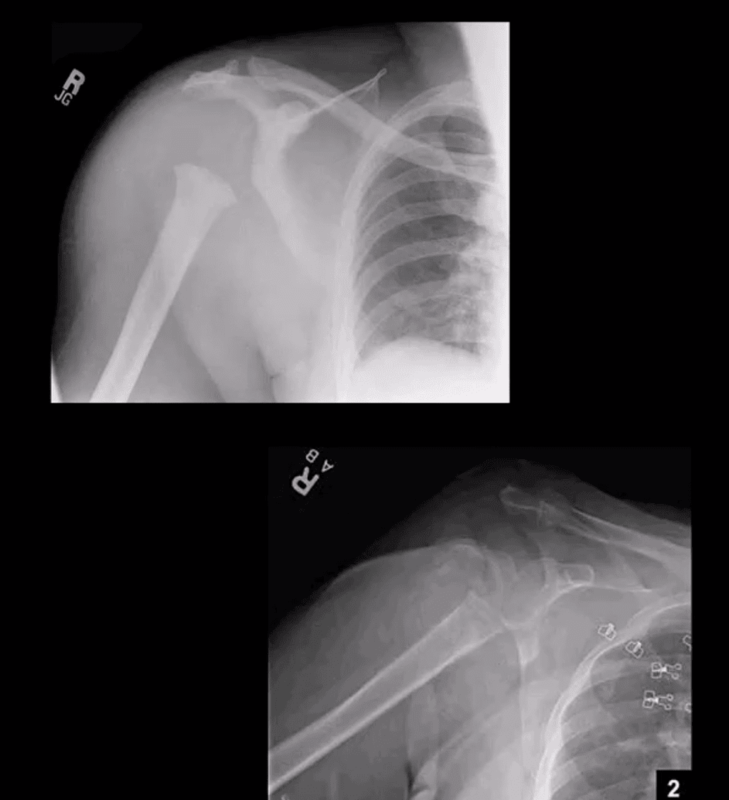 Note: L shoulder x-ray revealing cartilage destructionand symmetrical joint loss, multiple erosions, andlikely loss of RTCM support with superior headmigration, ST effusion present. 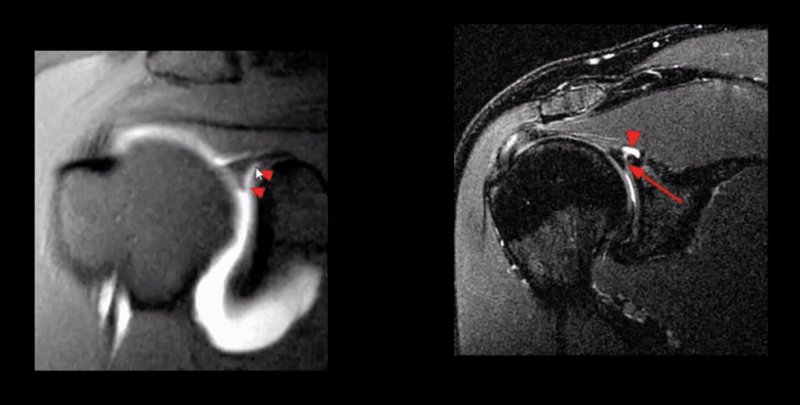 Septic Shoulder: shoulder is the 3rd m/c followingknee>hips. Patients at risk: diabetics, RA pts, immunocompromised, I.V. drug users, indwelling catheters etc. Routes: hematogenous (m/c), direct inoculation (iatrogenic, trauma etc.) adjacent spread(e.g. OM). Staph. Aureus (>50%) m/c. Clinically: joint pain and dec. ROM, fever 60% only, toxemia, inc. ESR/CRP. 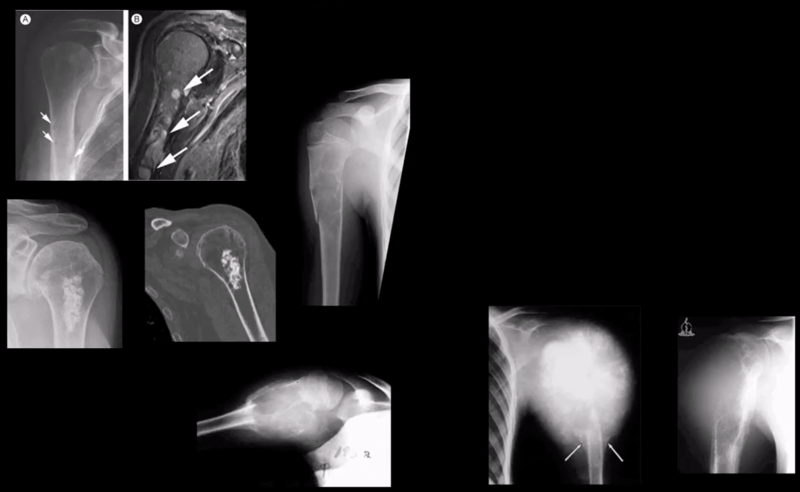 Dx: imaging and joint aspiration/culture. 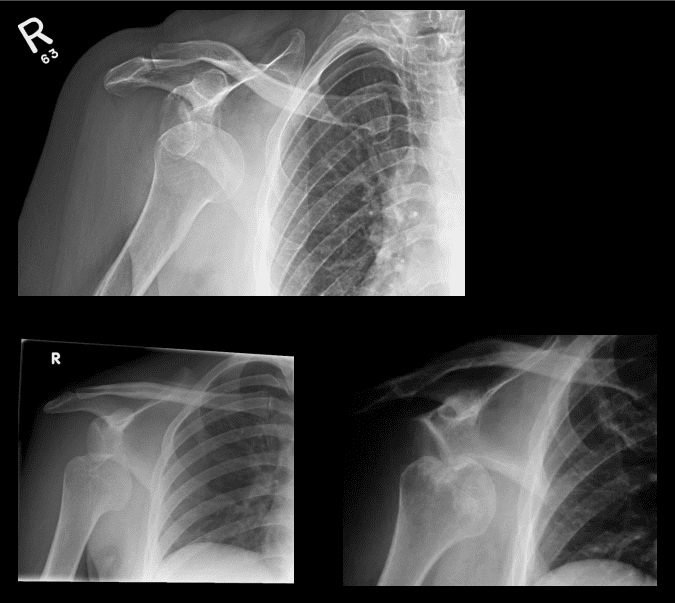 RadDx: early x-rays often unremarkable except ST effusion/fat planes obscuration, joint widening. Later7-12 days patchy osteopenia, moth-eaten/permeating bone resorption, articular destruction, joint narrowing. May progress to severe joint destruction and ankyloses. Early Dx & I.V. antibiotics are crucial even before culture. Operative irrigation and joint drainage in some cases. Complications are possible esp. if Rx is delayed. MSKUS with needle aspiration may help. 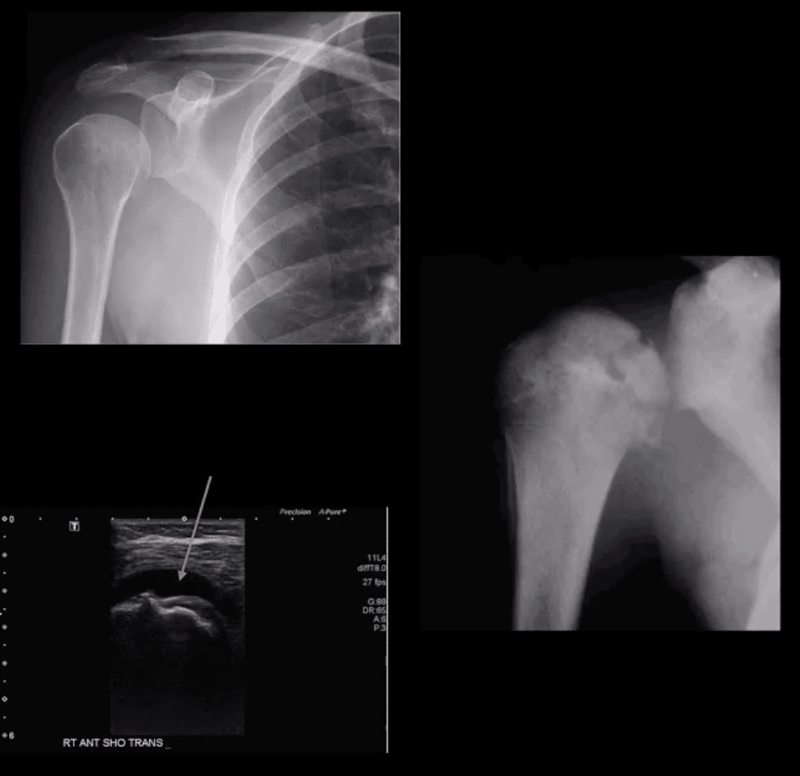 Note: (top image) non-traumatic joint widening with inferolateral head displacement d/t septic A dx: by needle aspiration Staph. Aures. Management: orthopedic referral, core decompression in early cases, hemiarthroplasty in moderate and total arthroplasty in severe cases. Clinically: night pain, pain at rest etc. Labtests: unrewarding, in severe caseshypercalcemia may be noted. MRI is essential to Dx. Especially in cases of primary malignant neoplasms Evaluate extent, soft tissue invasion, preoperative planning, staging, etc.